Have you ever attended a fitness festival? I learned of FitFluencers Katrina Scott and Karena Dawn's (aka K&K) Tone It Up Challenge through Self magazine's newsletter. I signed-up for the challenge and did the suggested work-outs. The playfulness and youthful energy of the two cheerful fitness gurus reminded me of my daughter and nieces. 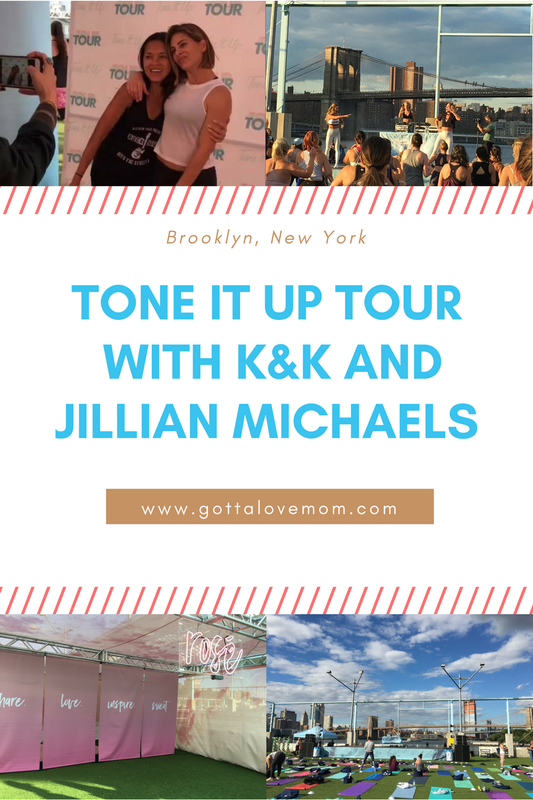 A month ago, I found out that K&K are doing a fitness festival (Tone it Up Tour) in Brooklyn, New York (!!!) with celebrity trainer, Jillian Michaels (!!!!!!). In case you're from another fitness planet and you haven't heard of Jillian Michaels, she's best known as the intense personal trainer at the reality television show, "The Biggest Loser". Push-ups, squats, weight "lifting", downward dog and planks were all foreign to me until after my fourth child, FOUR, was born. I was approaching 40 when I started working-out, but I didn't get somewhat consistent until 2011, after my 47th birthday. Jillian Michaels' 30 Day Shred was (and still is) my go-to work-out to get me back on track. When I first heard of the tour, I wasn't sure if it was something I would like to go to. My RN daughter, ONE, had to work that day and my friend had other plans. I didn't know anyone who was going but I penciled it in my calendar regardless. (Maybe that's it! I manifested it with my affirmations). Ten days leading to the event, I asked Hubby if I we have the budget for me to purchase the VIP Tone It Up tour ticket - and to my surprise he said, "Yes!" I was ecstatic because it's like opening a Christmas and Hanukkah present in September. I was busy with my other tasks on my to-do list that I didn't get the chance to actually purchase the tickets. Every day, for 10 days, I asked Hubby, "Should I?" to the point that he wished it was already the day after the tour. "Because on that day it's either you're ecstatically sharing stories about your new adventure or you're trying to rationalize why it was not a good idea that you decided not to go." We're sorry, there are no tickets currently available through TicketWeb. Needless to say, I didn't know how to react. My heart felt like crying but my head was telling me to move on and that it probably wasn't meant to be, but my youngest, FOUR, told me to believe that it will happen. I sent an email to ToneItUp's Customer Service and went out for a walk with Hubby. When we got back, I got an email stating that the problem was resolved. So there I was, ready to press the "Buy Ticket" button again, and voila, I'm in! That night I went to bed early but I couldn't sleep. I kept dreaming about the event. I was anxious on "what to wear", "what to do", "how do I make friends?" and "what do I do when I see Jillian Michaels?" On the day of the tour, I told my daughter all about my anxieties and she only had 1 advice: BE YOURSELF. She also reminded me that I have a perky, cheerful personality so I should fit right in. So what can you expect from a Tone-It-Up fitness festival? It's a fitness festival so expect to wear your most comfortable work-out clothes. I was waiting in line to check-in when I met 2 very nice TIUers. They seemed to be two best friends who are die-hard K&K fans. She's from New York, and she's from Atlanta. They told me about the many Tone It Up retreats they'd attended and how they looked forward to wearing the cute and colorful athleisure outfits. I think I heard other people mentioned something about mermaids, too. Oh by the way, there's only 1 line to check-in whether you purchased a General Admission or a VIP ticket. Through out the event, you're encouraged to get to know the person next to you. Luckily for me, I met 2 new amazing friends who truly admire K&K. Their genuine personality and positive energy filled your heart with love and inspiration. No wonder the whole venue was surrounded with Share. Love. Inspire. Sweat reminders. Witnessing K&K laughed, complimented each other and encouraged one another, reminded me how important it is to have that "one person", your BFF. Yoga Mat, Yes. Bag, No. In case you were busy and didn't get a chance to read the email regarding the tour, bringing a bag to the venue is a no-no. I'm guessing it's for security reasons. You don't need a bag anyway because one of the giveaways is the Tone-It-Up string bag for General Admission and a tote bag for VIP ticket holders. The giveaway also included the booty band, ocean blue hat, and sunscreen. You also don't need to worry about bringing your own water bottle because the event was sponsored by CORE Hydration perfectly balanced water, and you can avail as many water bottles as you want. Once you walk-in, you'd be on sensory overload. Music by DJMadds was playing. There were so many to see that for 15 minutes I forgot why I was there. I was distracted as I checked the Braid Bar, Tone It Up merchandise tent, beauty salons and the Core Intention Tent, when it dawned on me that for me to get a good spot, I had to reserve that spot. After I wrote down my core-intention (healthy, stronger me #CPT) , I got myself a name tag to mark my yoga mat. Here's a little suggestion: write your Instagram name on the card and not your full name like I initially did. Do what millennials do. It's cooler that way. Plus, it's an era when you don't exchange business cards but instead you follow each other on @instagram. I am thankful that Katrina and Karena had the vision to create such a community who genuinely empowers one another. In writing this article, I got to know K&K, how they met and what inspired them to launch the Tone It Up (TIU) Community and how they remain relevant to this Fitfluencer Market. In a much I'd love to get to know more behind the heart and soul of Tone-It-Up, I was there because I wanted to work-out with my fitness idol, Jillian Michaels (JM) and to have a chance to get lots of hugs - and that I did! The funny thing was that when I was talking to the TUIers, they told me that JM can be "good scary". Her work-outs are very intense, and unlike K&K who are both peppy and encouraging, JM will push you to work a little more harder. I quietly laughed because I already knew that, and that was probably why I was shaking when I finally got to thank her for being an inspiration. In the opening monologue of Jillian Michaels' 30 Day Shred DVDs, she'd tell you to "make it count" and reminded you that "there's a price in order to be the sickest, strongest version of you. It means there will be a lot of sweating, and shedding a few tears and I'll try not to draw blood but I can't make any promises." The first fitness instructor who took the stage was from Core Power Yoga Williamsburg followed by Jillian Michael's who got us all sweaty with the 30 minute cardio-HIIT work-out routines that covered strength, cardio and abs. The Meet-and-Greet followed the work-outs. K&K took the stage after JM. The Meet and Greet happened at the VIP lounge where the TIU Team set up pastel-colored couches, pillows and blankets where you can enjoy a sip or two of the complimentary rose. I only hang around the VIP lounge long enough to take in what just happened and publish an Instagram post of my photo with Jillian Michaels because I wanted to work-out with K&K - and I was so glad I did. I love the finale at K&K's workout set - when you partnered with your new friend, held hands, and leaned back as you put your trust in each other to maintain the balance and keep your feet on the ground. It's difficult to describe so you just have to attend one of these events to truly appreciate what I'm trying to explain. I just want to warn you, you might get hooked after one Tone-It-Up Tour! I didn't stay for the after party but I heard it was a blast. I also didn't get a chance to take advantage of the massage tables, braid corners, DIY jewelry and more but I did take time to watch the sunset. As a story teller, I would have loved to be on every tour and document the reactions from the TUIers - the diehards, the rock stars, the newbies, the millennials and the baby boomers like me. Everything comes to an end, like any other story. However, as I walked back to the subway station, it felt like a new story has just began. As I passed by our old neighborhood where Hubby and I used to live and hang-out, I got nostalgic and wondered what it would have been like to raise our four (4) kids in Brooklyn.